Anyone else having a hard time thinking about work after spending an indulgent weekend with family and friends?! Tomorrow morning will come soon enough, so it’s time to start thinking about what I’ve got planned for my groups. Thankfully, I have been busy making some new holiday products that my students are so excited to be use! Since it’s the TpT Cyber Monday sale, it’s a good time to start purchasing some of those items on my Wish List. To see what some of my blogger friends will by buying tomorrow, be sure to follow the linky back to Short and Sweet Speech. Here are some of my favorite products for this time of year! Hot off the press, this Rudolph inspired open target game is going to be one of my go-to games for my mixed therapy groups. I’ll be able to target multiple skills while students try to be the winner who ends up with the red nose on his/her reindeer. My students love interactive, repetitive readers. The interactive nature helps to promote visual attention which is very effective with my ASD students. These books help to develop vocabulary and early literacy skills, in a fun and engaging nature. 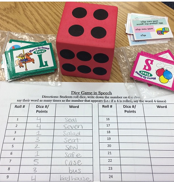 I also like to use related activities and games to reinforce the same vocabulary and concepts. I’ll be using my Gingerbread, Gingerbread Book and related activities in the next few weeks. With so many young articulation students, who are not established readers, I will be using my No Prep Articulation Worksheets – Christmas Themed, which are picture supported. These print and go worksheets cover over 14 sounds including blends and vocalic /r/. There are 63 worksheets in all. My students love the books and posters from Monae’s Speech House.The pictures are so bright and engaging and they are perfect for targeting vocabulary and concepts. I’m not sure I will be able to pick just one book, but I’m leaning towards the book “Hey Santa, Hey Santa, That’s Not Your Hat”. I’m not sure about your students, but mine love when I break out the play dough! I think these gingerbread themed play dough mats for articulation are a must from Small Talk SLP. I’m also planning on grabbing these winter themed interactive books by Communication Window. I can not have enough interactive books! Also included in this bundle are some sentence flip books, which are perfect for my caseload! Happy Shopping during this Cyber Sale! Don’t forget to leave feedback on your purchases. You will earn credits that can be used towards future purchases! First, I need to develop a schedule. Sounds easy enough but it’s not. The students can’t be pulled during their itinerant times, wellness (formerly known as recess), lunch, recess or core instruction. Doesn’t leave much of the day for students who require pull out service. It’s especially tough when you’re negotiating for that time with the other service providers. We now meet as a team (Speech, OT, PT, reading, resource and psych. services) to schedule at the same time. This has been extremely helpful in avoiding overlap of services. It is also beneficial when trying to schedule co-treats with other service providers. Once the schedule is on paper, it doesn’t necessarily mean it will actually work in real-time. Usually it takes a few weeks to work out the kinks. The first few weeks of service are spent establishing relationships and setting expectations. If it’s one thing I’ve learned over the years it’s that students are most productive during speech when they like to come. If students do not want to be there because they think they are missing something or not enjoying the activities (not all students will like all the activities all the time) they become challenged to fully engage and therefore the expected results can be compromised. I’ve also learned that clear expectations and routines need to be established. 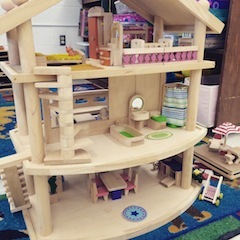 I think most children (especially K-2) like when things are organized and predictable. When students know what to expect, it helps them to be ready to learn. Once we have that basic foundation of therapy established, we can start to target specific objectives. We will do that by reading books, using materials, playing games and making crafts. To make our articulation drill work fun we will be using some Back to School and Fall Themed Roll and Color reinforcers worksheets. We will also be playing some articulation games, including these quick play games. Here’s at least one craft that we will try. These are just some of the fun things planned for this month. It’s going to be a great month! Recently I had the good fortune of reviewing some great products from Beautiful Speech and TLC Talk Shop. I am also excited because each of these ladies has agreed to give away their products to a lucky winner! In the spirit of the giveaway, I will also give away one of my products. I currently work with preschoolers and school aged students, grades K-2. I am always looking for interactive, hands-on activities that are bright, engaging and hit as many targets as possible. Aren’t we all?? These products do just that! I will start with Kristin’s Verb-Pronoun Flip and Practice Book. This interactive flip book provides targets for subjective pronouns, is/are and 20 verbs. This product can be used as an interactive flip book (that’s how I’ve been using it) or as an interactive cut and glue activity. The pictures are bright, clear and large, which is perfect when using in a small group or individually. 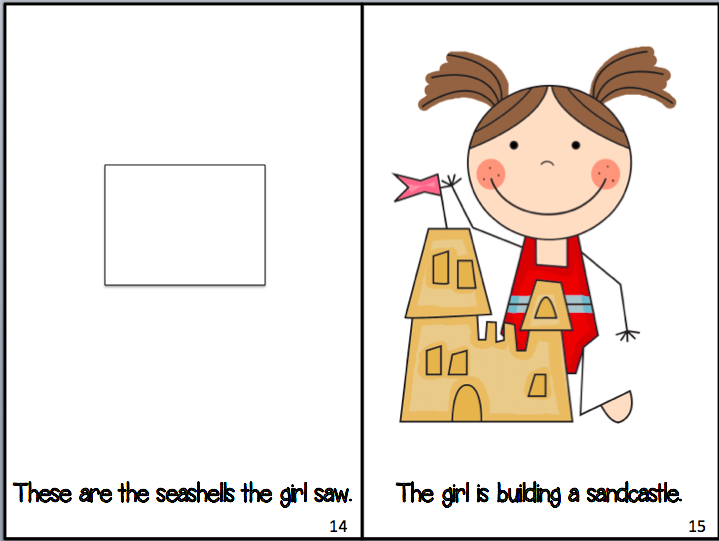 When used as a flip book, students can generate sentences to match the pictures. 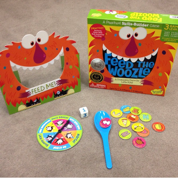 The books can also be used for asking and answering questions, such as “What is he doing?” and “Who is climbing?” This product also lends itself to expansion questions such as “When do you swim?” and “Where do you dig?” This product is especially effective with those students who have decoding skills that are stronger than their comprehension. 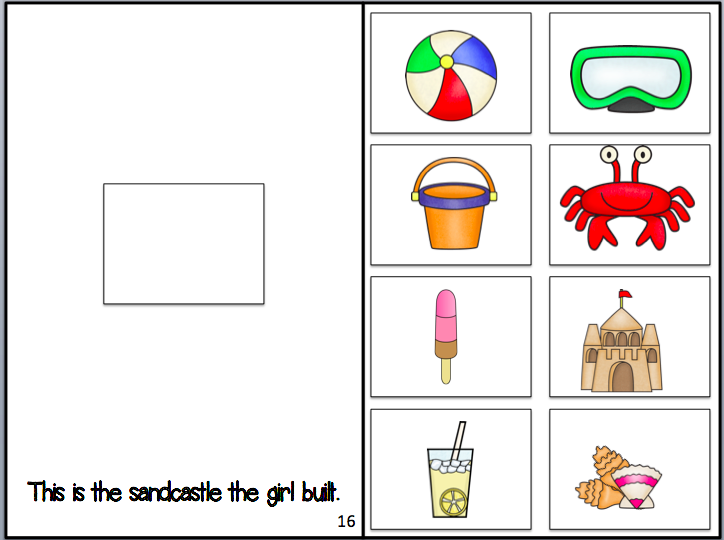 Students can match the verb words to the action pictures, helping to build comprehension. This quality product is certainly becoming a staple during my therapy sessions. This product could also be used by special educators. I have also been able to use the fun and interactive books that target multisyllabic words by Tami from TLC Talk Shop. 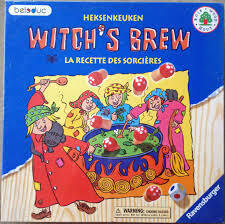 This product contains two interactive story books. The books are bright, engaging and just fun! They target vocabulary and speech production of multisyllabic words. Also included is a board for barrier games and following directions. Task cards for various “WH” questions is also included. This is a perfect activity when you are grouping students with various needs. 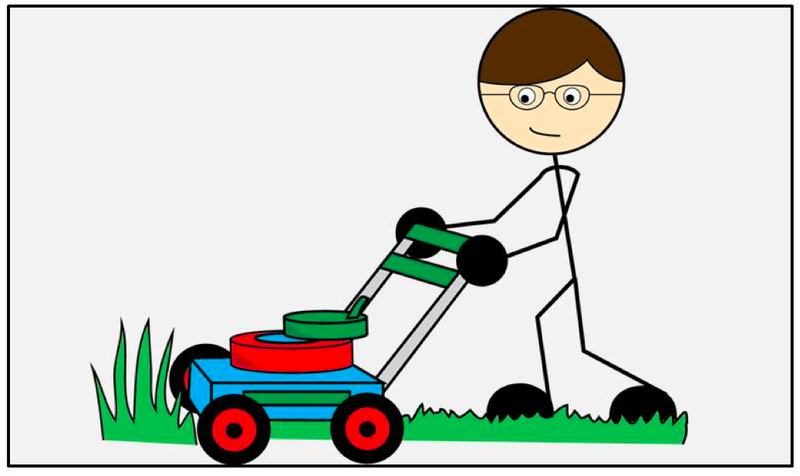 There are even homework reinforcement pages included where students can practice production of multisyllabic words, as well as think about categories. I have also used the Speech and Language Dojo Bundle. 265+ Act It Out Sound Loaded Articulation Cards. Students have the opportunity to practice following directions, and articulation all at once! Problem solving is also targeted for those students who are guessing the actions. 25 K Cards 25 G Cards 25 F Cards 25 V Cards 23 CH Cards 25 SH Cards 25 TH Cards 30 S & S-blend Cards 30 L & L-blend Cards 30 R & R-blend Cards There are also blank cards so that you can create your own Act It Out Cards. 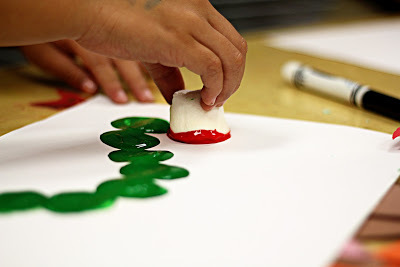 My students LOVE roll and cover, and roll and color activities. There are colorful ninja token pages that can be laminated so that they can be used as boards. 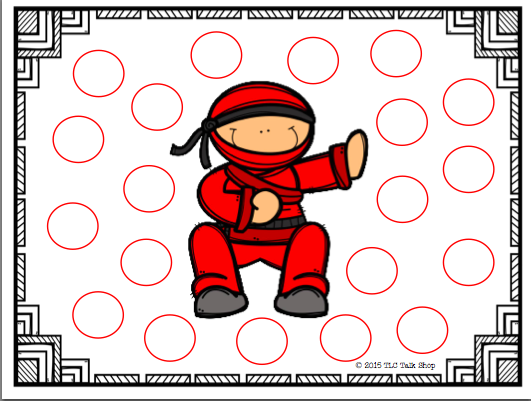 There’s also a black and white ninja token board for a low ink option or to use with daubers, another favorite in my speech room! There are 20 description cards students use to figure out what is being described; 25 single word cards for students to describe as well as a Descriptive Features Mat. CATEGORIES: There are multiple ways to work on categories. There are 5 cards for what doesn’t belong that provide visual representation. There are 15 word lists cards for what doesn’t belong. These could also be used to target auditory memory. There are 20 name the category and add to it cards. 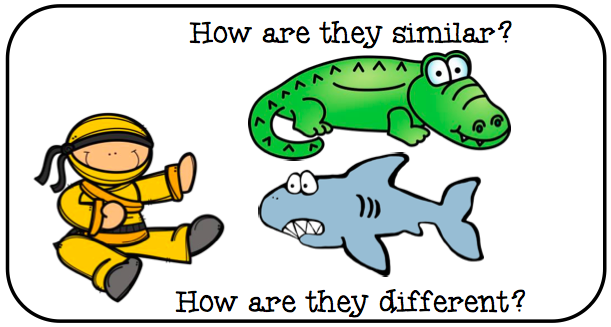 COMPARE/CONTRAST: Students can practice similarities and differences by describing the compare and contrast cards. There are 10 cards that have pictures and 20 that have written words. ACTION/SEQUENCE: Also included are 30 Act it Out Action/Sequence Cards- Students can take turns acting out basic sequences for actions such as brushing teeth and putting on shoes. Other students in the group can practice problem solving by guessing the action sequences being performed. ABSURDITIES: There are 30 absurdity cards that describe silly situations, such as “The girl rode her broom to school”. Students can use problem solving to determine what is wrong and practice use of sentence structures by recreating a sentence that makes sense. INFERENCE: There are 30 inference cards that require students to determine “where” someone is based on the location described. Students also describe “what” someone is doing based on the actions described. Students also explain “why” someone is feeling a certain way or performing a certain way based on the actions described. RECALLING DETAILS: Also included are 30 Recalling Details Cards. Questions target Who (5); What (5); Where (10); and When (10). This set is just loaded with activities that hit almost so many targets and are appealing to a wide range of grades and ages. Since it is June (and some of us are still in school), I thought I would give away my Summer Interactive Grammar Books. There are 2 interactive summer themed interactive type books. Subjective pronouns he/she/they are targeted as well as possessive pronouns his, her and their. Eight irregular past tense verbs are targeted, as well as has/have. These books can be used as part of therapy, or as part of a center. They could also be sent home to be used as reinforcement of skills. 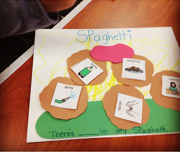 Instead of creating a book, copies could be made to create an interactive cut and paste activity. Just eliminate the the full board on the last page. I probably joined Instagram a few years ago and like most social media I belong to, I joined to keep tabs on my boys. I was also interested in seeing what some of my friends had to post as well. I posted an occasional photo here and there but I could go days and weeks without really looking at it. I’m not exactly sure when I decided to start following other speech pathologists, but when I did, a whole online community of generous therapists opened up to me! Instagram was where I discovered other therapists looking to collaborate on the Newbie Blog Hop, including co-hosts SLP Chelsea and Jen from Speech Therapy Fun. Thanks to them, I have a blog, TpT store and most importantly a new online mastermind group that provides support and collaboration for a group of us who are looking to further our practice and share our information and resources with others. Recently Jessica from Consonantly Speaking and Kristin from Simply_Speech organized a contest through Instagram. The challenge was to post a different picture each day of the month for May in an effort to raise awareness for Better Hearing and Speech Month. I decided to challenge myself and post a picture each day. I think in the beginning I was so worried about what I was going to post, I hadn’t really thought much about what I would SEE posted by others. I am so impressed with the group of therapists who participated and shared their ideas. I know I will be walking away with much more than I put out. Although there are still a few days left, I wanted to share some of my favorite posts from the contest…. Articulation, we all know it can be a little dry, so we are always looking for ways to make it fun and engaging. I know I can easily fall into the comfort zone of my favorites. 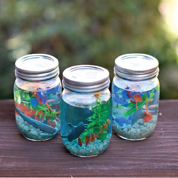 I will definitely be adding some of these simple, but adorable craft ideas to future artic sessions. 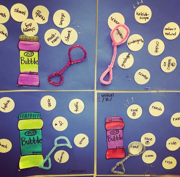 Bubble craft picture from my.speech.er. Each bubble has a speech target. I will use pictures in the bubbles for my non-readers. 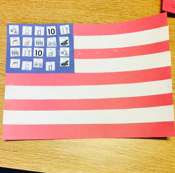 I love this flag craft idea from slptree. I will certainly be using this over the summer. Who doesn’t love spaghetti and meatballs?? Can’t wait to make these meatball speech words with the students. Thanks to talkintime for sharing. In addition to crafts, we know the little ones love to “feed” animals, monsters and old ladies! I think I need to add Feed the Woozle shared by vlinderct. I’m also going to have to get my hands on one of these giant dies like sparklyspeechgirl shared. My kiddos love the smaller foam die. I can’t wait to introduce this giant one! Looks like we could even target some math with this! Anyone who has read previous posts knows that I LOVE using arts and crafts in therapy. I’m planning on using both of these crafts this summer shared by speakingofspeech. 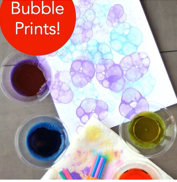 Bubble prints and oceans in a jar! I have done oceans in cups with jello, and oceans on paper plates with plastic wrap, but never in a jar. Looking forward to the challenge! I am an avid reader, although this spring has slowed me down a tad. 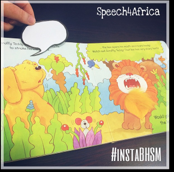 I love this idea from speech4africa, using speech bubbles in books to target feelings, social thinking and more. 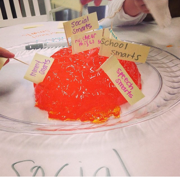 Another great idea to target social thinking by sunshineonaspeechday is using a jello “brain” to identify different types of “smarts”! I think as a whole, you might not find a group recycling more than slps! We are forever saying, “don’t throw that away, I can use that! 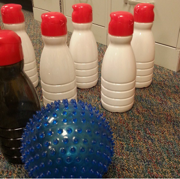 I’m just not sure how quite yet.” I love this idea from slpstephiek for using recycled creamer bottles as bowling pins. Who doesn’t love to bowl?? As I’ve mentioned in an earlier post, I have been trying to take back the speech room in terms of organization, aesthetics and function. I think there should be an HGTV (is that still a network??) show featuring classrooms and therapy rooms. Anyone else agree?? 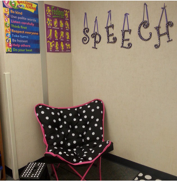 I love the polka dots and speech sign shared by slpstephiek. 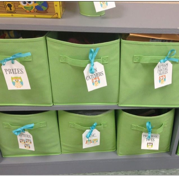 I also love these fabric bins shared by puttingwordsinyourmouth, that look attractive yet are perfect for keeping items/materials out of view. 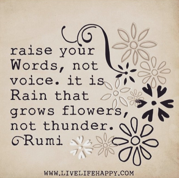 This is one of my favorite finds that I could not wait to share with Kat, the OT. 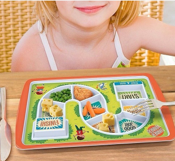 Speakingofspeech shared this food plate to be used with picky eaters. Why didn’t I think of that?! I love a good quote. the_speech_peach shared this one. I think it should be hung in all classrooms, regardless of grade. This is just a sample of the incredible posts shared by a generous online community of therapists. If you would like to see more, go to Instagram and search #instaBHSM. You won’t be disappointed.